Dental inlays and onlays restore your tooth structure. The cosmetic dentistry procedure improves your dental health by correcting your damaged or decayed teeth. Inlays and onlays provide you tooth repair without the need to invest in a dental crown. The treatment can restore areas of your tooth that a dental filling cannot. Treatment with dental inlays and onlays effectively covers a larger portion of your tooth structure. Their coverage is similar to that of a dental crown. Your inlay or onlay is crafted from porcelain. This enables it to match the structure and shade of your surrounding teeth. Inlays and onlays provide you a permanent tooth restoration. Your damaged tooth structure is removed and the remaining surface is prepared for your inlay or onlay. Your dentist will take an impression (mold) and provide you a temporary inlay or onlay as your permanent one is prepared by our selected dental lab. Within two weeks your permanent restoration will be ready for fitting. The shade and fit will be adjusted to complete your procedure. 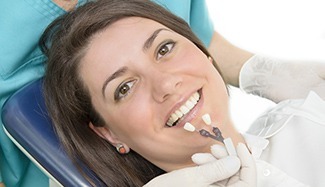 Contact your Palm Beach Gardens dentist, Dr. Alvarez, about inlay and onlay treatment to restore your damaged teeth. The great advantage of Inlays or Onlays is that sometimes it substitutes you from getting a crown. Inlays and Onlays are made of either porcelain, gold or composites. Dr Alvarez will discuss with you your best options.